Take a look at the two charts below. If you want to understand the unique appeal of someone like Stephen Curry—a player on whom both the basketball romantics and the quants agree, a guy who represents a rare intersection of narrative and analytics—there is no better place to start. The first chart, by Div Bhansali, shows every player in the past five years who's shot more than six threes a game, plotted against their three-point percentage. There's Ray Allen, at the top of the cluster on percentage, and Ryan Anderson's last two seasons are near the cream of the group. 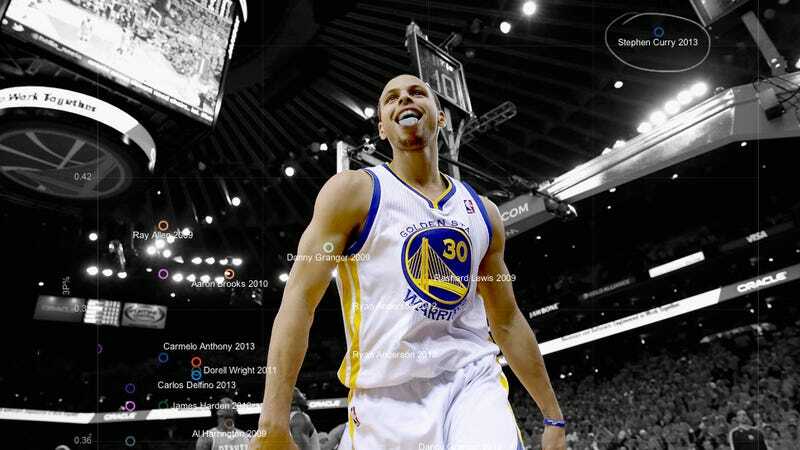 And there, outside them all, way off in another cosmos, is Steph Curry. Same goes for the bunching in the second graph, by Aleksey Nozdryn-Plotnicki, which shows the average distance and location of all shots by notable players. There's Steph, revolving around the rest of the league like a rogue satellite, canning threes from deep orbit. If you've been keeping up with the glut of NBA previews and analysis in the run-up to the season, you might have noticed a common thread: Steph Curry blows everyone's mind. And a lot of that has to do with visualizations like these, which call to mind Bill James's famous phrase about statistics that have acquired the power of language. You look at these charts, and you can discern something like a narrative. You can see a little guy, statistically exceptional without being physically so, working with the ball at the top of the key. You can see him running his man through a ball screen and squeezing off a shot over the hand in his face, or maybe pulling up in transition and bombing away from 25 feet. You can see the shimmy and the quick release (because how else would a little guy take—let alone make—so many threes?). It's all there in the numbers, in the otherwise cold Cartesian renderings of our liveliest sport. And god, that's about all anyone wants in life, isn't it? Steph Curry shooting threes from outside NFL field-goal range, giving bad ideas to the next generation's J.R. Smith? Remember: He isn't just chucking threes from outer space: he's chucking threes from outer space and making them. Tom Haberstroh, in a piece begging Curry to shoot even more threes, noted that, last season, he sank 48 percent of threes from between 28 feet and half court (the NBA three-point line is 23-feet, nine inches—22 feet at the corners). Forty-eight percent. For his career, he's shot 37 percent (88-238) from 27 feet and out—a mark that just about matches Melo's best season from three in general. What's fun about Stephen Curry is that he has to do it—he's a weirdo out of necessity. Kevin Durant can do whatever he wants—he basically did a pseudo-LeBron impersonation for much of last year—and at this point I'm not sure KD shooting 50 percent on 25 full-court shots a night would even faze people. Curry is different. For him, tossing in three-pointers from 30 feet isn't an aspect of his game so much as an imperative. That shows up in the stats, too. Steph came out on top of Kirk Goldsberry's new outside shooting metric (and third in overall scoring, behind LeBron and Durant), but his chart doesn't look like those of the other elite players. They can muscle their way to absurd efficiency around the hoop—Curry's actually a little bellow average near the rim, though he's made big improvements there since his rookie season. He's good but not exceptional from midrange. But drag him out beyond the arc and he's the damn Golem of Prague. That looks nothing like the Steph you saw in the Nuggets and Spurs series, or even the one who killed the Knicks for 54 in MSG, right? These days, the screens usually come much higher on the wing, and Curry passes much earlier, or will often curl around, give a hard step toward the paint, and step back or to the side for what is effectively a wide-open jumper thanks to his balance and whip-fast release. It's brilliant to watch at full speed, an action no one else in the league has the tools to pull off consistently. You can see that difference obviously enough when you watch him live, but you can also see it when you look at Steph, out on his own (in an injury-filled 2011-2012), shooting way more unassisted threes than is usual for a guard at a crazy high percentage. His game, his moves, can be glimpsed in his statistics, in a way that other signature moves—Dirk's fadeaway, for instance—can't be. It's as close as you get to a bridge between aesthetics and analytics. He needs only 0.4 seconds to release his jump shot, fastest in the NBA. You see that, and you picture that switchblade shot of his, not, say, Paul Pierce's slow steamroller jumper. Curry led the league last season in fast-break points outside the paint (fourth overall, behind Harden, Westbrook, and LeBron), nearly doubling the total of the next guy on the list, 222 to Kyle Korver's 125. You could almost see him faking a pass to a cutter and whipping up a jumper from the wing as you read that, right? Are a good number of these stats cherry-picked? Of course they are—but that's part of it. The phenomenon of Steph's appeal is that, buried in the stats, there are more of these stories waiting to be told. Did you hear about Steph's efficiency on shots from 45 feet? About the stretch where he took 15 threes a game? About the time he drilled clean through a mountain in one night, dropping dead with a basketball in each hand? That's what's most fun about all this: that it's fun at all. Often—not all the time, but often enough—stats are wielded as a sort of smelling salt. They're presented as a sobering means of instruction, urging fans not to be quite so impressed by the most viscerally exciting players—Derrick Rose has to draw more fouls, after all, and remember that Kobe's PER usually isn't top 10, and please be mindful of sample size as you watch the comet known as Yasiel Puig streak through the sky. Thrilling players, slouching toward the mean. With Curry though, the stats inspire something else: Wait, you've been doing what over there??? With luck, we should be in for some more this year. Curry is 25, and has finetuned his game every season he's been in the league. And know this: As impressive as he was in the playoffs, Curry actually cooled off relative to his regular season numbers. If he stays healthy (yes, it's the mandatory, buzzkilly stipulation with all Steph arguments), Golden State is stocked with players who fit alongside Curry. Steph has always existed between the cracks of conventional NBA stardom. He isn't an impossible specimen like LeBron, but plays nearly as efficiently just the same. So while James continues to be the most comprehensively dominant basketball player alive, statistically or otherwise, Curry offers something almost more improbable: a stat line that's a highlight reel all on its own. Regressing is Deadspin's new home for sports science, statistics, medicine, and other nerdy endeavors.